In spite of his size, Murdoch is gentle and shy. He prefers peace and quiet, also he can work very hard with any job he has, and his favourite hobby is to have a quiet run through the countryside. Murdoch was brought to relieve the engines of their heavy workloads. 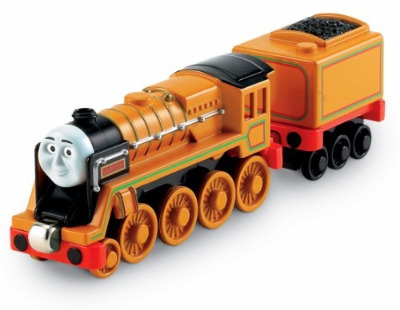 He was big and strong, so the other engines were eager to learn more about him. Murdoch, however, disliked the noise of their chatter and got cross at Salty and Harvey when they inquired about his past exploits. The next day, Murdoch finally had a chance to pull a train in the quiet countryside, but his journey was interrupted by a flock of stray sheep. Murdoch had to wait with the noisy sheep until Toby could bring the farmer to lead them away. That night, Murdoch found Salty's and Harvey's company a relief.